Can I Give My Cat Garlic? While most of us would not even try to eat garlic as a food on its own (and hats off to anyone who does), it has become a staple in lunch and dinner recipes in all sorts of cuisine. Whether you live on frozen entrees, your cooking skills go only as far as stir fries and pasta, or you’ve graduated from culinary school, you probably eat foods containing garlic on a regular basis. Garlic resides in everything from pizzas to mushroom bakes to cheap supermarket crackers, so many of us eat more of it than we realize. For those of us who like to share our food with our pets, this can be worrying. While our dogs seem able to gobble up just about anything (except chocolate), many cat owners find that their feline friends’ stomachs are more finicky. Cats are obligate carnivores, which means that they often have difficulty digesting the plant foods we and our dogs know and love. 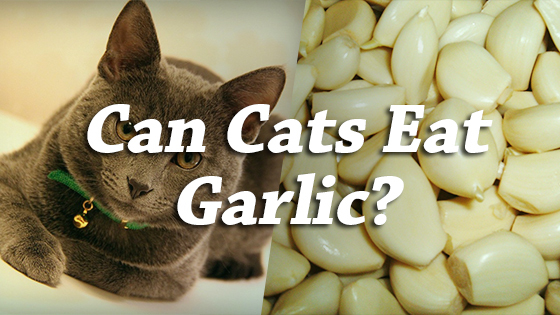 So, where does garlic, which is in all our favorite savory foods, fall on the cat friendliness spectrum? Can cats have garlic? Unfortunately, the answer is NO, cats should not eat cooked or raw garlic—like most vegetables in the onion family, it is toxic to our pets. While a very small amount of garlic pasta sauce once or twice a year probably will not result in serious health problems, large doses of garlic (or even very small doses fed frequently) can result in life-threatening health problems. To keep your cat safe, avoid feeding them meals containing garlic. This includes packaged or processed foods like hummus! Some pet owners feed their cats garlic in the hopes of staving off fleas, but there is no evidence that this practice is effective. Garlic is far more likely to make your cat sick than it is to stop their itching! If your cat has problems with fleas, you can try bathing them with diluted apple cider vinegar or lemon juice for a safer at-home flea remedy. If the problem persists, seek veterinary care. So, what’s the problem with garlic, anyway? Well, in the short term, garlic often causes gastric distress—our cats are biologically carnivores, so they often struggle to digest plant foods properly. But, for the more pressing issue: garlic is dangerous for the same reason that onions are dangerous, which is a condition called Heinz body anemia. One of the most sinister things about this condition is that it often does not show up immediately after the food is consumed, so many pet owners do not realize that there is a problem until their cat is very ill. While not considered by some to be quite as toxic as onions, consuming small doses of garlic over time can have the same result. That is why it is vital to keep it out of your cat’s diet altogether! A bit of garlic here and there can easily add up to chronic toxicity. What is Heinz body anemia? Put simply, it’s an illness that occurs when your cat’s red blood cells have been damaged or destroyed by ‘Heinz bodies’, which are microscopic clusters of damaged hemoglobin that build up inside the red blood cells. This buildup of useless hemoglobin handicaps the cells, greatly reducing their ability to carry oxygen throughout the body. Though this illness can effect both dogs and cats, it’s far more common in our feline friends. Cats with diabetes, thyroid problems, and many types of cancer are also far more likely to develop this illness. This condition can occur as the result of binge eating a large amount of garlic all at once, but it can also be triggered by small doses of garlic ingested over time. Cats afflicted with Heinz body anemia will often develop a high fever, extreme fatigue or weakness due to lack of oxygen, poor appetite, pale or discolored skin, pale gums, lips, and tongue, and, in severe cases, discolored urine. Other more general poisoning symptoms include excessive drooling, nausea, vomiting, abdominal bloat or pain, and diarrhea. Your cat may also experience weight loss, excessive sleep, heart irregularities, and rapid or struggled breathing. If you suspect your cat has been eating garlic and they develop any of these symptoms, be sure to take them to the vet’s office immediately. Heinz body anemia is often difficult to treat and can lead to complications or death if treatment is delayed. In conclusion, most veterinarians agree that garlic should be completely off-limits to cats. Even if your cat appears to digest a small amount of garlic without any difficulty, the effects of consuming the toxins found in this pungent vegetable can add up over time. Even feeding your cat very small, regular amounts of garlic can result in severe anemia due to the formation of Heinz bodies. 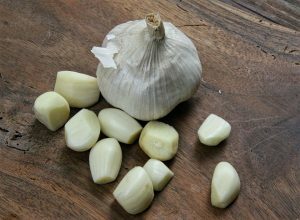 Garlic is not safe as a staple, flea remedy, or even a rare treat. Can Dogs Eat White Chocolate? Can Dogs Eat Hazelnuts?